Washington Unemployment Again Touches Record Low, Wage Hikes Next? Washington state's unemployment rate dipped to a record low of 4.5 percent in October. 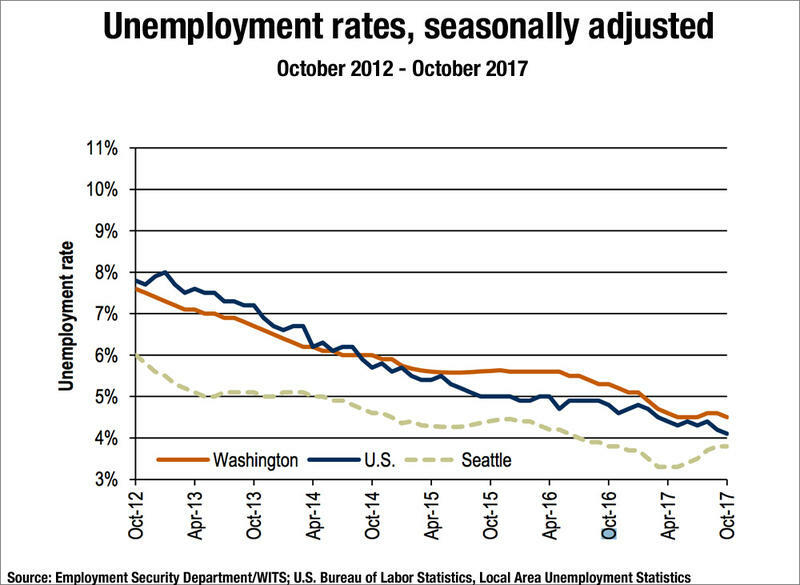 The statewide unemployment rate in Washington again touched a record low of 4.5 percent in October. That's according to the Washington Employment Security Department, which has been tracking the number since the mid-1970s. The latest jobless reading ticked down from September's 4.6 percent revised rate. Oregon's unemployment rate is even lower than Washington's. The most recent reading released Tuesday by Oregon's Employment Department pegged it at 4.3 percent. 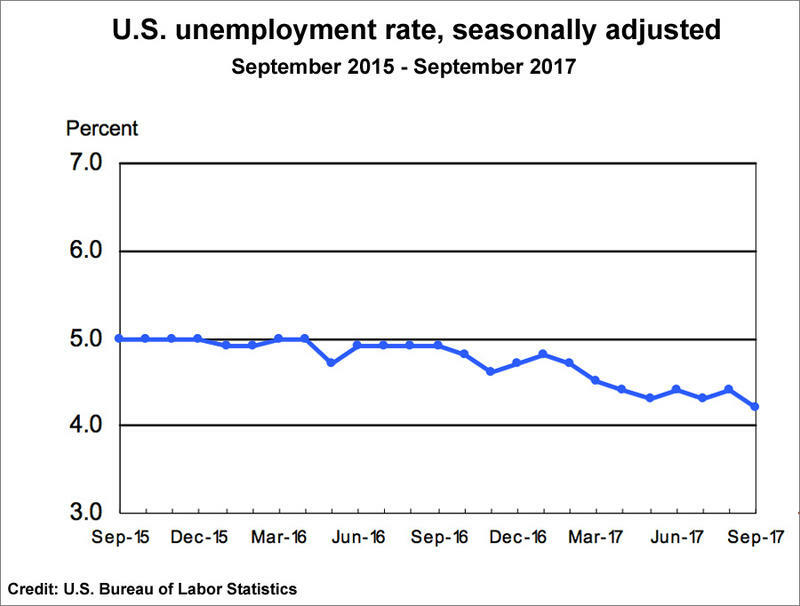 The national unemployment rate is 4.1 percent. Washington state labor economist Paul Turek said the jobless rate is at or near its floor, a condition economists call "full employment." "We're about at the point where it is really difficult to see that the rate is going to go much lower for any of the states that have reached that particular (statistical) series record low,” he said. Turek said in spite of strong hiring conditions, wage increases have been "muted.” But he said he and other economists expect that to change soon. "The thinking is that as the labor market tightens, we should start to see more increases in wage levels in the next three months,” Turek said. Turek said the average worker's pay raises slightly exceeded inflation during the economic recovery up to now. At the national level, growth in wages is running around 2.5 percent per year. "Economic conditions and labor market conditions for the state look to be much better than the weather outside," Turek quipped in a teleconference Wednesday. Employers in Washington state added a net of 6,900 jobs in October. Strong hiring occurred in professional, scientific and technical services, trucking and construction. According to the latest jobs report from Oregon's Employment Department, employers in the Beaver State added 11,600 jobs in October. Agency economist David Cooke said the gain in Oregon was the largest monthly increase since 14,100 jobs were added in February of this year. Employment numbers are out for both Washington and Oregon. Since last September, Washington has gained more than 91,000 jobs and Oregon has gained more than 37,000 jobs. The largest growth in both states has taken place in the government sector.